It is not unusual to see a guy in the gym doing his best to maximize his workouts without thinking whether or not he will be able to practice at the same pace when he hits the gym again. Even though he can actually be an enthusiastic beginner, doing exercises at a high intensity is the mistake many men make in an effort to improve as quickly as possible and impress their friends. If getting the best results from training is your main goal your body has to be efficient, in this article I will discuss the benefits of the Blackwolf hunter pack for men and how it can help boost your training efforts. Finding the right balance between being too lazy and forcing yourself to constantly seek new challenges is the equation that provides you with the best results no matter the situation. Once you have determined what training regime and lifestyle suit you best, you will be able to learn an important lesson that some people learn the hard way – your muscles can’t always achieve the goals your mind sets as priorities. Seeking a supplement that will boost your performance, increase your endurance and help your muscles recover before your next gym session can sometimes be problematic. Every once in a while, men feel like they desperately need something to increase their confidence and help them get started with their workout routine with ease. Enhanced focus and higher energy levels allow for longer workouts at an increased pace; thereby, you should consider taking a pre-workout supplement as it will give you more fuel and help you blast through your workouts without getting tired. Blackwolf TRACK is a comprehensive pre-workout supplement that can help you get the most out of your workouts by giving you more power before you start working out. It is based on the Blackwolf Power Blend™ combination of ingredients to optimize the ratio between the ingredients and make sure your body gets what it needs in optimal quantity. Just by taking the supplement half an hour before every gym session, you will be able to improve your endurance thanks to the several key ingredients: BCAAs (L-Leucine, L-Isoleucine, and L-Valine), proteins, and creatine monohydrate. In fact, more than 20 ingredients work together to momentously boost your energy levels and make your workouts less exhausting. Blackwolf HUNT is an intra-workout supplement that aims to increase your strength and endurance during your workouts, as well as to help you reduce muscle pain and eliminate fatigue. BCAAs (Branched-Chain Amino Acids) and proteins are responsible for giving you that extra edge while trying to take your game to the next level and become more serious with your workouts. Vitamins B5, B6, C, and E play an important role in protecting your cells from oxidative stress and maintaining the normal functioning of all the processes in the body. The result of combining these ingredients is a massive improvement in terms of the overall strength and endurance. The moment you will experience the multiple benefits of HUNT is very likely to be at the end of each of your exercises as the intra-workout supplement will compensate the lost energy and force your body to cope with the last few repetitions without much effort. Last but not least is the ELIMINATE post-workout supplement, an essential addition to your daily routine to allow your muscles to recover and regain the lost energy. It contains all the necessary ingredients to encourage the growth of lean muscle mass and start the recovery process right after your workout. More than 20 active ingredients have been blended together to reduce fatigue, restore the glycogen and blood glucose levels, strengthen the immune system and maintain its normal functioning even after an intense session. Given that being consistent with your workouts is the key to being able to see a constant improvement over time, ELIMINATE and its unique ability to promote muscle recovery are of great importance for you as an athlete. That being said, you will take the right path if you decide to add ELIMINATE to the list of products you purchase on a weekly or monthly basis. 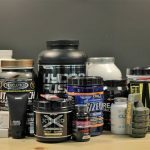 Each of the Blackwolf pre workout supplements boasts some extraordinary benefits and special ingredients to improve the final formula and make the dream to greatly improve your physical shape in just a couple of weeks come true. If used together, TRACK, HUNT and ELIMINATE act as a powerful combination that provides you with a tremendous amount of energy, sharpens your focus and promotes muscle recovery before, during and after your workouts. As far as the pricing is concerned, the Blackwolf Hunter Pack for men cost $82.95. The deal includes all the supplements (TRACK, HUNT and ELIMINATE) and they come in a 450gr jar each. The prices are a bit higher if you decide to purchase any of the supplements individually: HUNT and ELIMINATE have the same price tag of $37.95, whereas TRAIL is just a tad more expensive at $44.95. Blackwolf hunter pack for men besides offering you a quality product it is more affordable than its competitors. 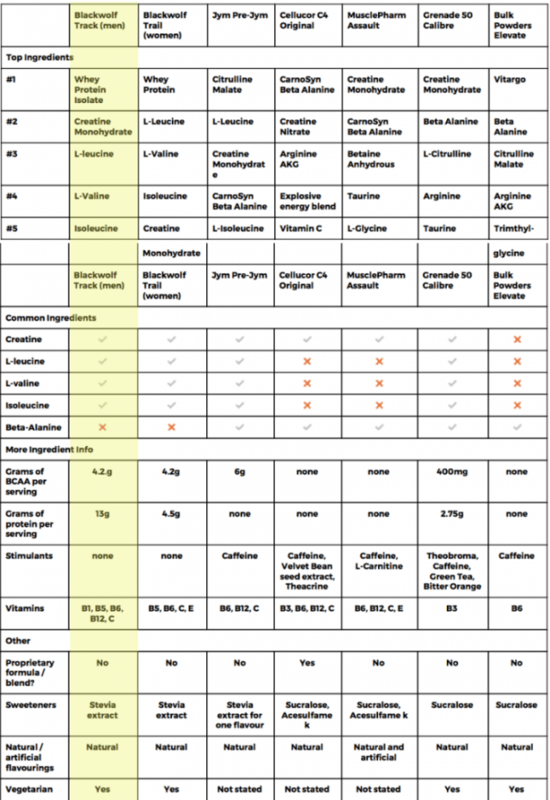 It combines things like creatine, BCAA's and minerals all into one complete workout stack. When you buy the complete Blackwolf workout Pack the company includes a free shaker and a 5 step workout guide offering you a value you will not find anywhere else. If you are not convinced I would invite you to take a close look at the ingredients and compare them to other leading products, what you will find is that Blackwolf offers better quality than other leading products. Taking all the factors into account, Blackwolf Hunter Pack pre workout for men is an ideal choice for everyone seeking a way to improve their performance and get one step closer to having an almost perfectly shaped body. It combines all the best features and implements them into three separate products, all of which are in charge of strengthening your muscles and reducing the recovery time, increasing your focus before and during your workouts, and improving your endurance. The price point puts the Hunter Pack in the affordable range of products, with almost everyone being able to afford it and take advantage of its multiple benefits. Black Wolf also offers a special formula for women called the huntress pack with exclusive ingredients made just for women. By far the ingredients in these formulas are some of the best you will find in any pre-workout supplement. Where to buy Blackwolf hunter pack pre workout for men? Blackwolf Workout products are not sold in stores it can only be purchased from the official website. This will ensure you receive a genuine product along with free worldwide shipping. If you purchase the complete stack you will receive the free supplement shaker and workout guide as a bonus. Should You Do Rack Pulls?